In the interest of brevity, we forgo any detailed discussion of the psychometric properties of the motives measure. Suffice it to say that the CMS has a stable and replicable three-factor structure and appears to have acceptable internal and test—retest reliabilities. Although the motives measured in the CMS were empirically rather than "rationally" derived, they overlapped considerably with other conceptualizations of the reasons why workers might engage in OCB (e.g., Bolino, 1999 ; Ferris, Judge, Rowland, & Fitzgibbons, 1994 ). However, these motives may be more complex than earlier motive-based approaches suggested. For example, PV motives involve the need to be a helpful individual (value expression) and the need to be accepted and to interact smoothly with one's peers (social adjustment). OC motives also appear to have two interrelated components: a desire to help the organization because one identifies with and takes pride in the organization and because it is seen as being committed to one's welfare. IM motives appear to involve a desire to maintain a positive image and to avoid creating a negative one. Independent evidence of this interpretation comes from Forde (2000) , who administered the CMS along with the IM portion of Paulhus's (1998) Balanced Inventory of Desirable Responding (Version 7) to a sample of working college students. The correlations between PV and OC motives and IM were -.05 and .18, respectively ( ns ); IM motives correlated -.42 (.01) with IM. That is, lower scores on the IM subscale were associated with more concern with IM. Although the PV and OC subscales of the CMS were strongly related, there are good reasons to believe that they tap distinct constructs. First, in all of the factor analyses, the individual items loaded "cleanly" and consistently on the two factors. Thus, at the individual item level, the subscales were quite distinct. Second, in Study 2, the two subscales had different patterns of intercorrelations with other predictor variables and were differentially correlated with the Altruism and Conscientiousness subscales of OCB. Finally, Forde (2000) found that whereas the OC motive was significantly correlated with measures of affective commitment to the organization and perceived organizational support ( r s = .38 and .40), the PV value was not ( r s = .02 and .04). Thus, there is a consistent pattern of convergent and divergent correlations that suggests the two factors concern different constructs. Why then are the factors so strongly intercorrelated? We would tentatively propose that although the constructs are distinct, they share certain important commonalities. A critical one is concern about the well-being of another entity and a desire to be helpful and cooperative. Thus, both PV and OC motives may be, at least partially, what Clary et al. (1998) called "value-expressive" motives; that is, the person is motivated by the values that he or she holds. This study was driven by the premise that people often choose to engage in OCB because it meets certain needs for them. We hypothesized that if such motives were measured, they would show a theoretically coherent pattern of correlations with the relevant dimensions of OCB. We also expected that motives would account for significant amounts of unique variance in OCB. These hypotheses were generally supported. Considering first the zero-order correlations, overall, the strongest relationship for PV motives was with the Altruism dimension of OCB; the strongest relationship for OC motives was with the Conscientiousness dimension. Furthermore, the PV motives—Altruism dimension correlations were invariably higher than the OC motives—Altruism dimension correlations, and the PV motives—Conscientiousness dimension correlations were invariably lower than the significant OC motives—Conscientiousness correlations. In some instances, significant associations were found between PV motives and conscientiousness-related subscales and between OC motives and altruism-related subscales. However, when OC motives were partialed out of the former relationships, they became nonsignificant; and when PV motives were partialed out of the latter relationships, they also became nonsignificant. In other words, across all three rating sources, the PV and OC motives cleanly "mapped onto" the relevant OCB dimensions. Thus, it seems reasonable to argue that OCB is, at least in part, a proactive behavior driven by motives. There were no significant correlations between IM motives and either of the OCB dimensions. The significant negative correlation between the trait of IM and scores on the IM subscale ( Forde, 2000 ) may partially explain these null results. Specifically, responses to this subscale may have been suppressed by a desire to avoid presenting oneself in a negative light. Indeed, the respondents who may have been the most likely to use OCB to manage impressions may have been the least likely to endorse the IM items. Despite this potential problem, when IM motives were entered last into the hierarchical regressions, they added significant amounts of variance in both the self-ratings and the peer ratings of Sportsmanship, suggesting a cooperative suppression effect. At present, we cannot explain why this occurred. The three subscales were substantially intercorrelated, and, as Pedhazur (1997) noted, in such instances it is often difficult to understand at a theoretical or conceptual level why suppressor effects occur. It is clear that additional research is needed to further explore what role, if any, IM motives, alone or in combination with other motives, might have in OCB. Furthermore, it is certain that it would be premature to rule out IM motives as a cause of OCB. The final issue to be considered is whether these motives represent enduring dispositions or transitory reactions to organizational practices. We would argue that PV motives may well reflect an enduring disposition. Recall that the strongest correlate of PV motives was the other-oriented empathy dimension of the PSB. This correlation was much higher than the correlations between PV motives and the measures of organizational justice and mood. Very similar correlations have been obtained in other studies that have used the CMS and the PSB ( Forde, 2000 ; Tillman, 1998 ). These patterns of strong intercorrelations between PV motives and an enduring personality characteristic suggest that it may be a relatively stable aspect of a person's disposition and would not vary substantially from one job setting to another. In contrast, OC may be a less enduring and more modifiable motive, which is influenced by an employee's thoughts and feelings about the organization. In support of this conclusion are the consistently strong intercorrelations between scores on the OC subscale and measures of organizational justice, organizational commitment, and perceived organizational support. We do not believe, however, that the OC motive is a surrogate for such thoughts and feelings about the organization. Rather, it may moderate the relationship between them and OCB. For example, Tillman found that the relationship between organizational justice and OCB differed as a function of the strength of OC motives. There are, of course, some limitations in this study. One limitation is the samples that were used. It is clear that before definite judgments on the role of motives in OCB are made, these findings need to be replicated in other settings with other samples. Another practical concern is the IM subscale. At this time, its value in the prediction of OCB is limited. One reason may be the transparency of the items, but we are currently exploring another possibility. Namely, the manner in which the IM subscale is constructed and/or scored may fail to distinguish between IM that is "acquisitive" (i.e., intended to get something from others) and that which is "self-protective" (i.e., intended to avoid negative evaluations; Gangstead & Snyder, 2000 ). When these two kinds of IM motives are separated, a clearer relationship between IM motives and OCB may emerge. Despite these limitations, the results of this study lend substantial support to the argument that motives play an important role in OCB. Thus, we would argue, as did Folger (1993) , that individuals consciously choose to engage in OCB because such actions meet their own needs and enable them to attain desired outcomes. The results also suggest that a functional approach to OCB may help organizations increase the incidence of this class of behaviors. More specifically, because the PV motive appears to be an enduring personal attribute, it may be possible to select for individuals who are motivated to help their coworkers. In contrast, the OC motive appears to be more situationally determined, and, thus, if an organization wishes to increase the level of this motive among its employees, it may need to engage in actions that evoke this motive. Of course, the success of such strategies is an empirical question, and it remains for subsequent research to determine the practical value of a motivational approach to OCB. We would argue, however, that the results of the present study suggest that such an effort might further our understanding of OCB and increase its frequency among employees of large organizations. Bolino, M. C. (1999). Citizenship and impression management: Good soldiers or good actors? Academy of Management Review, 24, 82-98. Borman, W. C., Penner, L. A., Allen, T. D. & Motowidlo, S. J. (2001). 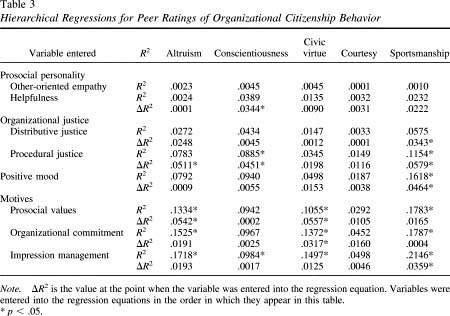 Personality predictors of citizenship performance. International Journal of Selection and Assessment, 9, 52-69. Brief, A. P., Burke, M. J., George, J. M., Robinson, B. & Webster, J. (1988). Should negative affectivity remain an unmeasured variable in the study of job stress? Journal of Applied Psychology, 73, 193-198. Clary, E. G. & Orenstein, L. (1991). The amount and effectiveness of help: The relationship of motives and abilities to helping behavior. Personality and Social Psychology Bulletin, 17, 58-64. Clary, E. G., Snyder, M., Ridge, R., Copeland, J., Haugen, J. & Miene, P. (1998). Understanding and assessing the motivations of volunteers: A functional approach. Journal of Personality and Social Psychology, 74, 1516-1530. Ferris, G. R., Judge, T. A., Rowland, K. M. & Fitzgibbons, D. E. (1994). Subordinate influence and the performance evaluation process: Test of the model. Organizational Behavior and Human Decision Processes, 58, 101-135. Folger, R. (1993). Justice, motivation, and performance beyond role requirements. Employee Responsibility and Rights Journal, 6, 239-248. Gangstead, S. W. & Snyder, M. (2000). Self-monitoring: Appraisal and reappraisal. Psychological Bulletin, 126, 530-555. George, J. M. (1991). State or trait: The effects of positive mood on prosocial behaviors at work. Journal of Applied Psychology, 76, 299-307. Katz, D. (1964). The motivational basis of organizational behavior. Behavioral Science, 9, 131-133. Morrison, E. W. (1994). Role definitions and organizational citizenship behavior: The importance of an employee's perspective. Academy of Management Journal, 37, 1543-1567. Motowidlo, S. J., Borman, W. C. & Schmitt, M. J. (1997). A theory of individual differences in task and contextual performance. Human Performance, 10, 71-84. Omoto, A. & Snyder, M. (1995). Sustained helping without obligation: Motivation, longevity of service, and perceived attitude change among AIDS volunteers. Journal of Personality and Social Psychology, 68, 671-687. Organ, D. W. & Ryan, K. (1995). A meta-analytic review of attitudinal and dispositional predictors of organizational citizenship behavior. Personnel Psychology, 48, 775-802. Penner, L. A. & Finkelstein, M. A. (1998). Dispositional and structural determinants of volunteerism. Journal of Personality and Social Psychology, 74, 525-537. Penner, L. A., Midili, A. R. & Kegelmeyer, J. (1997). Beyond job attitudes: A personality and social psychology perspective on the causes of organizational citizenship behavior. Human Performance, 10, 111-132. Podsakoff, P. M., MacKenzie, S. B., Moorman, R. H. & Fetter, R. (1990). Transformational leader behaviors and their effects on followers' trust in leader, satisfaction, and organizational citizenship behaviors. Leadership Quarterly, 1, 107-142. Smith, C. A., Organ, D. W. & Near, J. P. (1983). Organizational citizenship behavior: Its nature and antecedents. Journal of Applied Psychology, 68, 653-663. Snyder, M. (1993). Basic research and practice problems: The promise of a "functional" personality and social psychology. Personality and Social Psychology Bulletin, 19, 251-264. Van Scotter, J. R. & Motowidlo, S. J. (1996). Interpersonal facilitation and job dedication as separate facets of contextual performance. Journal of Applied Psychology, 81, 525-531. A detailed description of item selection and development is available from Sheila M. Rioux. Because of space considerations, initial studies of the construct validity of the CMS are not reported in this article. These studies provided some clear evidence that the PV subscale was construct valid; the picture for the other two subscales was less clear. A detailed description of the construct validity studies is available from Sheila M. Rioux. A direct product model ( Browne, 1989 ) was used to examine the latent structure underlying the matrix of raters and OCB subscales. The best fitting model indicated moderate convergent validity across the rating sources but a relative lack of discriminant validity of the OCB subscales within rating sources. Despite the discriminant validity problem, the separate subscales of the OCB measure were used in the analyses because of the relatively widespread acceptance of this conceptualization of the different aspects of OCB. Caution should be exercised, however, in interpreting the different regression analyses for the different OCB subscales. The order of presentation had no effect on scores on these measures; therefore, the two versions of these questionnaires were combined in the subsequent data analyses. A t test for dependent correlations was used to compare these correlations. This article is based on Sheila M. Rioux's doctoral dissertation, which was submitted at the University of South Florida. Portions of this research were presented at the 14th Annual Meeting of the Society for Industrial and Organizational Psychology, April 1999, San Diego, California. We are grateful to Tammy Allen, Walter Borman, and Mark Snyder for their helpful comments on earlier versions of this article. Correspondence may be addressed to Louis A. Penner, Department of Psychology, University of South Florida, 4202 East Fowler Avenue, Tampa, Florida, 33620-8200.